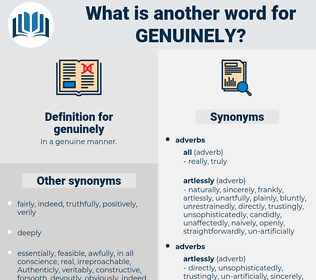 What is another word for genuinely? authentically, absolutely, certainly, definitely, seriously, effectively, meaningfully, frankly, earnestly, quite, wholeheartedly, exactly, realistically, utterly, totally, very, fully, completely, surely, deeply, purely, properly, heartily, Substantively, truthfully, conscientiously, fundamentally, intrinsically, entirely, perfectly, thoroughly, highly, terribly, firmly, faithfully, warmly, extremely, literally, profoundly, incredibly, rightly, desperately, downright, fervently, essentially, factually, clearly, awfully, openly, positively, strongly, basically, admittedly, fairly, materially, ultimately, gravely, strictly, obviously, legitimately, candidly, substantially, specifically, wholly, pretty, concretely, keenly, virtually, particularly, decidedly, plainly, undoubtedly, naturally. really, actually, honestly, real, sincerely. ostensibly, professedly, seemingly, plausibly, apparently, supposedly, outwardly.
" The Carringtons seemed genuinely glad to see me - and, now, if I may include you, I'm quite content to return," and he shook her hand, as though he meant it.